August 25, 2000, L. G. Crabo. Sympistis lacticollis is a small (FW length 12 - 14 mm) moth with a simple forewing pattern of thin black veins against a gray background that flies in dry forests and steppe in the fall. The forewing is even powdery medium gray, minimally darker basally and distally. Most of the veins are dark gray, darkest at the cubital veins. The antemedial line is reduced to a short oblique black segment at the costa and the postmedial line is only a dot on the costa. Short gray triangles between the veins form the terminal line. The fringe is gray, very weakly checkered with dark. The spots are absent. The hindwing is light gray, darker in females, with darker gray near the outer margin. The veins area dark gray but the discal spot is nearly obsolete. A thin terminal line is present. 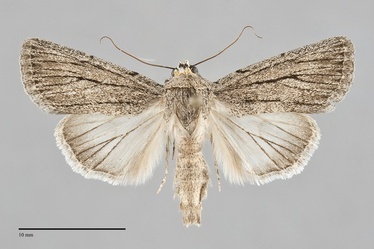 The hindwing fringe is white with a gray base. The top of the head is black. The thorax is powdery gray. The male antenna is filiform. This species can usually be identified by its small size, gray forewing with dark veins, and a black line across the top of the head. This species is widely distributed and relatively common on dry sagebrush steppe at low elevations and in juniper woodlands at middle elevations east of the Cascades. It is found in dry forests of pine and fir in southern British Columbia. 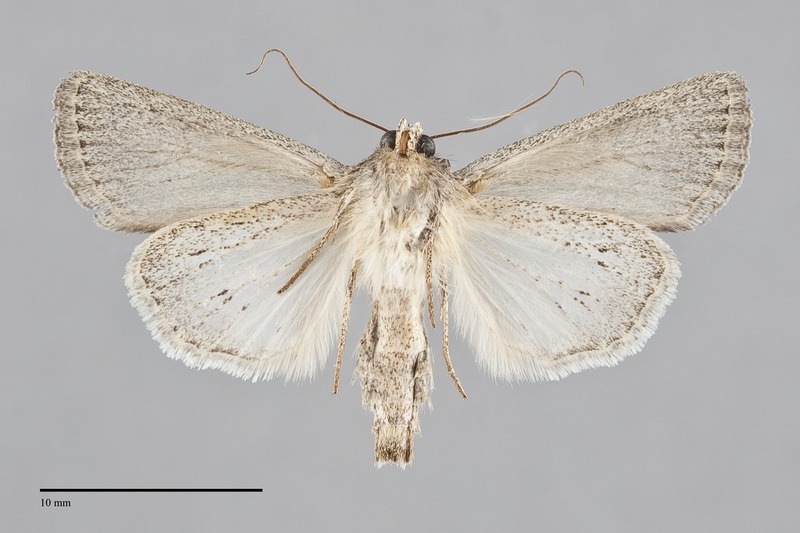 Sympistis lacticollis is found in the dry interior steppes of eastern Oregon and Washington. It also occurs in southwestern British Columbia and in southwestern Oregon. The records from the Columbia Plateua of Washington are curiously clustered in the northwestern part of this region despite sampling from other parts of the region during the appropriate time of year. Records from elsewhere are more widely distributed. The range of this species extends south through California, reaching the border with Mexico. The flight season of S. lacticollis is the fall. It has been found as early as the beginning of August, but most specimens are collected at the end of August and throughout September. It is nocturnal and comes to lights.